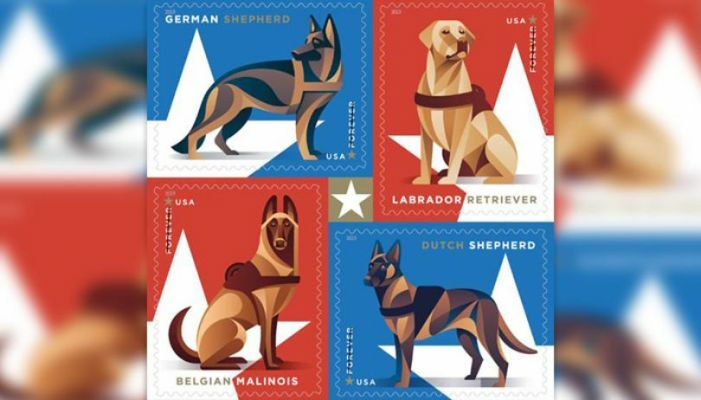 WASHINGTON, D.C. - The United States Postal Service has revealed several new stamp designs to honor the nation's military service dogs. The new Forever Stamps feature images of a German shepherd, Labrador retriever, Belgian Malinois (MELON – WAH) or Dutch shepherd. All of these breeds commonly serve in the United States Armed Forces. The postal service has introduced more than a dozen stamps for 2019, several with military themes. In October of last year, the USPS announced another postage rate increase. The First Class Mail letter rate for postage increased by five cents to $0.55 from $0.50, effective January 27, 2019. Each additional ounce for a First Class Mail letter will cost an extra $0.15 - a decrease from $0.21 in 2018.